System Extension Blocked. 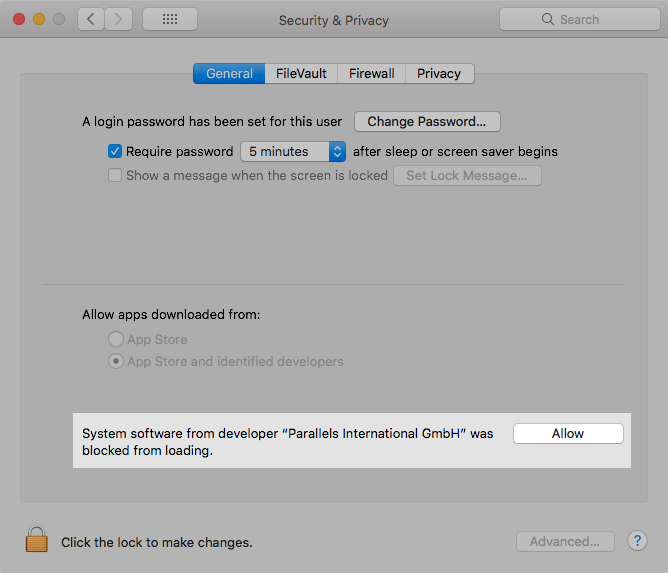 A program tried to load a new system extension signed by "Parallels International GmbH" and it was blocked. If you want to enable extensions from this developer, go to the Security & Privacy System Preferences pane. macOS High Sierra 10.13 introduces a new feature that requires user approval before loading newly-installed third-party kernel extensions. Third-party kernel extensions (KEXTs) that were already present when upgrading to macOS High Sierra are granted automatic approval. For more information please refer to the Apple's official tech note: Technical Note TN2459. Why Parallels Access needs its own kernel extensions? com.parallels.virtualsound.kext - Parallels Access Sound, creates a virtual audio driver that captures sound on remote computer and transfers it to connected mobile device. Also functions as a virtual driver for sending audio from mobile device’s microphone into a remote computer. com.parallels.virtualhid.kext — Creates a virtual driver for enabling Game Mode’s virtual gaming controller feature.